I’m a big fan of the Retrospective. I think it’s so important to take time to look back and reflect on how things have been going, and think about how to make things better on your team. There are heaps of different kinds of retrospectives for different occasions and to enable you look at your from lots of different angles. Regular retrospectives will open up great communication between team members and make it easier to talk about issues and successes. However, you can’t reap the full benefits of retrospectives if nothing changes afterwards. If the team feels like they are losing an hour of their lives to retrospect and then nothing happens they aren’t going to be keen to have one again. Retrospectives should happen regularly. Every 1-2 weeks AT LEAST. More than that and the feedback cycle is too long, the retrospective will likely take hours because so much stuff has built up. Keep them energetic, change up the format often and get different team members to facilitate and take ownership. Keep them constructive, follow the prime directive and ensure that there are action items that have owners and are achievable. I recently joined a team that was feeling quite disillusioned with their retrospectives. They were every 3-4 weeks, and the same issues came up time and time again. Nothing was changing and the team was frustrated. On my second day on the team we had a session and everyone was grumbling before we had even started, that it was pointless. It broke my heart. I felt like there was a massive lack of visibility to the items that had come up, no ownership and no follow-up. 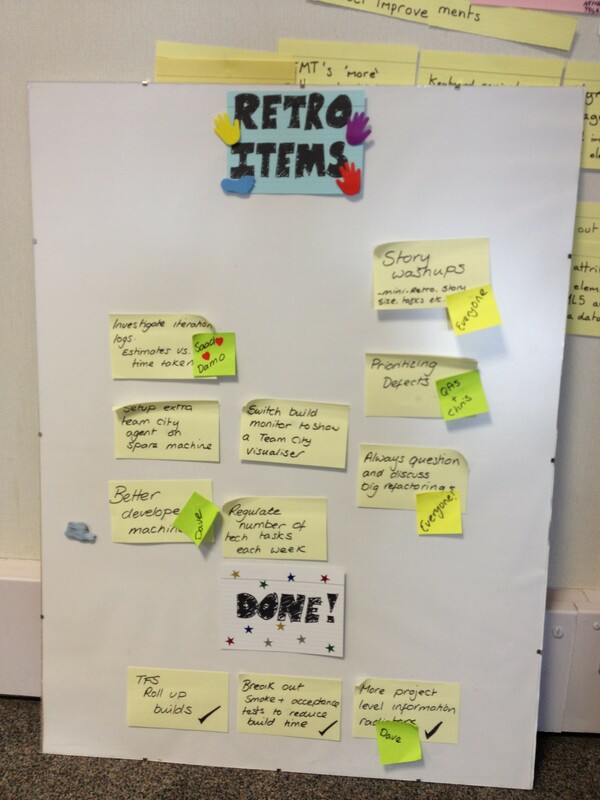 So I got hold of the items that had come up and created a Retrospectives Action Items board that lists all of the action items, their owners and equally as importantly, which ones we have actually achieved so that the team can see that we are making headway. Ensure the whole team can see the action items and who’s responsible for making each one happen. Regularly bring action items up and check progress during standup, remove any blockers if necessary. Celebrate the items that do get done. So far this has worked pretty well. I already feel there is a better energy and things are changing as a result of our last retrospective. Next mission, get them to happen much more often! I really like the idea of a retro-items chart. I am interested in knowing how your retrospective meetings happen? At my company I have pushed to even get post-project meetings to discuss what worked well and what didin’t but that is as far as we have come. What is their remit? From the looks of the actions it goes wider than project based work? I have been working on ‘Agile’ XP style projects, so retrospectives fit nicely while doing your 1-3 week Iteration Planning Meetings (IPM) or Sprints. Having said that, on my current project we don’t have formal iteration boundaries and so having a regular retrospective has been quite hard. Without that official stop and regroup teams tend to not make time. So in the end I just planned it myself and everyone came. (I also bribed them with snacks). The more that they get out of it each time the more that they (the team) will want to have another one. As for remit. For me, anything that affects the team and their ability to deliver quality software is fare game for topics. Sometimes it makes sense to have a retro focused on a particular topic, for example a particular release. I like an open forum, but for that they need to be regular otherwise you’ll get overwhelmed with topics. p.s. Sorry it took me so long to reply!